The Chinese government, social organizations and enterprises offered help to the affected people in Indonesia, and participated in the reconstruction efforts in the disaster-hit areas. Under a tall signal tower, dozens of tents have been set up. They are "offices" of Chinese telecom company ZTE in Palu, the capital of Indonesia's Central Sulawesi province, hit by devastating quakes and tsunami. Rindhu, one of ZTE's local staff in Indonesia, told Xinhua on Wednesday that ZTE's emergency team arrived in Palu immediately after the strong earthquakes struck late last month to assist local authorities in the recovery efforts. Devastating earthquakes and an ensuing tsunami ravaged the central Indonesian province on Sept. 28, leaving more than 2,000 dead and thousands of people homeless so far, with Palu worst hit. After the disaster, the Chinese government, social organizations and enterprises offered help to the affected people in Indonesia, and participated in the reconstruction efforts in the disaster-hit areas. Thanks to the effective cooperation between the Indonesian government, its people and the international communities including China, the daily life in Palu is returning to normalcy, with debris being cleaned up, more supplies delivered to the needy and banks and supermarkets reopened. Rindhu, 34, is the only woman in ZTE's temporary working site in Palu, as well as the head of the network maintenance team. Her colleagues seen her as a brave girl. Rindhu was asked to travel to Palu to repair the damaged telecom equipment network after the disasters. Flying from Jakarta to Massakar, the capital of South Sulawesi province, before taking a bus for two days from Massakar to Palu, Rindhu finally arrived in Palu on Oct. 3. "My colleagues have tried several times to persuade me to leave Palu. But I insist to stay and do my best and do it very quickly, so that those affected can get in touch with their families and friends," Rindhu said. ZTE is the network equipment provider for the whole Sulawesi island. According to statistics, the earthquakes of 6.0, 7.4 and 6.1 magnitude and the tsunami destroyed around one third of its telecom base stations on the island. ZTE's regional manager Wisnu Eka Putra believes that he is "a lucky man." He was on a business trip out of Palu when the disaster occurred. However, he returned to the city as soon as he could to start repairing the damaged network. After days of work, 90 percent of the damaged bases were fixed. Wisnu said. "I am proud to be able to make a difference in the reconstruction of my hometown." ZTE project director Zhu Shunrong told Xinhua that so far ZTE had sent nine batches of emergency maintenance personnel, more than 70 people, as well as 17 generators and over 20 vehicles to Palu. "Local network communication has basically returned to normal," he said. 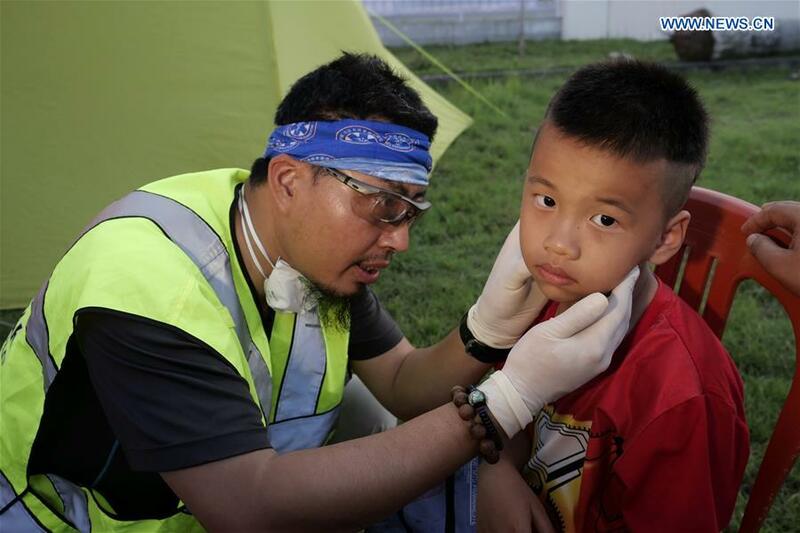 While Zhu and his Indonesian colleagues were busy with the repairing work, Chinese volunteer Du Hailang and his teammates were on the way to a local hospital in the adjoining district of Sigi. Most of the medical equipment in the hospital were damaged by the quakes. Portable ultrasound scanners and an electrocardiogram monitor brought by Du were immediately used in the hospital. "We come from Beijing Emergency Rescue Association at the invitation of Sigi District government. Later, we will go to the mountain areas of the district to check out if we are needed," Du said. Many other Chinese companies in Indonesia have mobilized their personnel and resources for disaster relief. P.T. Indonesia Morowali Industrial Park, a Chinese-Indonesian company which has been operating in the Central Sulawesi province for years, sent two ambulances and more than 20 health professionals to quake-hit Palu. An official from the China Chamber of Commerce in Indonesia said Chinese companies not only helped boost local economic development, but also shouldered their social responsibilities in the difficult times. Furthermore, the first batch of humanitarian supplies of the Chinese government, consisting of 1,200 tents, thousands of water treatment equipment, 200 generators and some other necessities, were flown to Palu on Tuesday evening. And four batches of aid are to be delivered in the coming days. The Chinese Embassy in Indonesia also purchased items needed by the victims and the Red Cross Society of China donated 200,000 U.S. dollars to its Indonesian counterpart, Palang Merah Indonesia, for relief efforts. Chinese Ambassador Xiao Qian said, "China and Indonesia are good neighbors who share weal and woe and are always ready to offer timely help for each other." "I hope the aid from China can cope with the urgent needs of Indonesia, and the Indonesian government and its people can feel the strong bonds between our two countries," he added.